Some of the best interviews occur when the person doesn't know they're being interviewed. It's sort of like the old TV show Smile You're On Candid Camera. I caught AHA Author Rochelle Campbell totally off guard in this 2 min 2 sec live conversation on Twitter. You can also catch her first interview here. Rochelle: Thanks! So glad the late hours are not readily seen on my face. This is the promo pic for my new book. You are on a roll. You inspire me to stay up and write all night! DOLLARS and Sense. Catchy title, it has mass appeal. 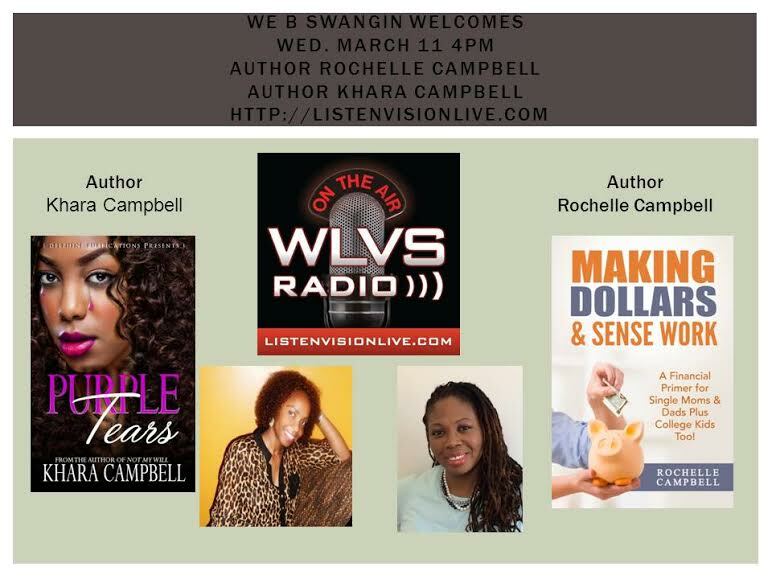 Rochelle: MAKING DOLLARS & SENSE WORK: A Financial Primer for Single Moms & Dads Plus College Kids Too! pic.twitter.com/zSJLOsgi46 I just wanted to get to heart of the matter. So many of us don't have any financial education under our belts this bk helps! Me: I would assume it would apply to men as well who pay child support. What is a must read chapter in the book? Rochelle: The one about Payday Loan Hell. A bank rep told me that banks can't help ppl in that sit. This bk gives u a ltr to stop them. Interesting. I'll make sure to focus on that chapter. Where did you get the inspiration to write a non-fiction. It's long ways from Fury From Hell? Rochelle: I was trying 2 decide what 2 write next. A friend suggested I pull back from the confusion & write what I was passionate about. That makes sense. There are plenty of things that our eyes have seen and our ears have heard that we can write about. Rochelle: Yes, it reminds me of Warren Buffet. When his body has a twitch, or a tingle he knows it means buy or sell b/c he's seen something. One last question. Hurry my 2 min 2 sec is almost up. People will start screaming bloody murder and unfollow me. Hell, I'm close to hitting 100k followers, I can't afford to lose anyone. Rochelle: You're crazy, you know that? Me: Yea, I know. that's why the Retweet Train is so popular. Anyways, heeeer's my last question. Was it easier writing a non-ficion than a fiction book? Rochelle: Nonfiction is easy for me as I went to school for journalism. Research, compiling data, etc is fun to me. :-) Fiction? Work! I would be remiss not to mention that you 're a beta tester for my new book How To Get 100,000 Twitter Followers, and you're living proof how well the strategies and shortcuts work. Rochelle: I was stuck at 5,000-6,000 followers then I saw some amazing results from other beta testers and said hey I need to see what's going on? Now, I have 10,000 followers in less than four weeks. The strategies are easy to do and the tricky part, they are easy not to do. I can't wait read your book. Yes, I remember those days when you were stubborn as a mule and wouldn't follow my advice. (LMAO! :-) But now you're own track for 100,000 followers. You can follow Rochelle on Twitter at @NotebkBlogairy, and she always follows back. Well, my dear, the clock on the wall says that's all. I hope you don't mind if I add this conversation as an AHA Interview. Rochelle: Sneaky! You scooped WLVS! :-) LOL. I'm sure it will be okay. Oops! I forgot to say, Smile You're on AHA Live! Thanks, you're a sweetheart. I can't wait to get my hands your new book. One idea can change a person's life. I feel a Best Seller in the making.